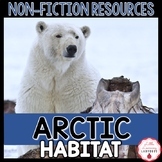 Use this resource as 5 centers and/or research materials for the arctic ecosystem. Encourage students to investigate the food web, fundamental needs, and adaptations. Nonfiction reading passage about the Arctic Region. Comprehension questions to go with it. Also an answer key. This packet includes a short reading passage, fill in the blank questions, multiple choice questions, pictures to support comprehension, graphic organizer, drawing activity, and short essay question. 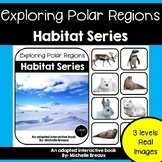 Emergent Easy Reader Book: "The Arctic Habitat"
Arctic Habitat Research Newsletter- Nonfiction Text! This is a 2-page newsletter that gives information on the arctic habitat. It gives information on... *Location *Weather *Animals *Plants *Geography A great resource! I created this arctic habitat worksheet for special ed students to teach them fun and simple facts about the arctic. It comes along with a PowerPoint presentation and test which you can find in my store! These are great for special ed or preschool! 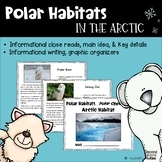 Guided notes to keep students engaged during a lesson about the arctic habitat. Students select from low fields and can circle the correct response. 20 (Spanish and English) Arctic animal vocabulary cards (40 total) and a chart with all of the vocabulary words. 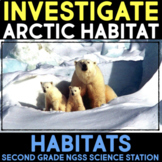 I created this PowerPoint to teach my special ed students about the Arctic Habitat. This is simple and fun- great for special ed or preschool! Check out my arctic worksheet and free test that come along with it! This cut-and-paste worksheet focuses on the different weather and animals you see in an Arctic habitat. When I was in the primary grades and teaching about habitats, this was a quick assessment I gave to my students. It is geared towards the special needs students I had, but can be used with any student.